Dad, can you build me a Boomhut? A polar bear riding a whale in the ocean. Hmmm. Polar bear…check. Whale…check. Ocean…check. This must be a book about global warming and species extinction. The cover of The Tree House (de Boomhut) certainly suggests this possibility, although I’m not quite sure what a polar bear riding on the head of a whale signifies. 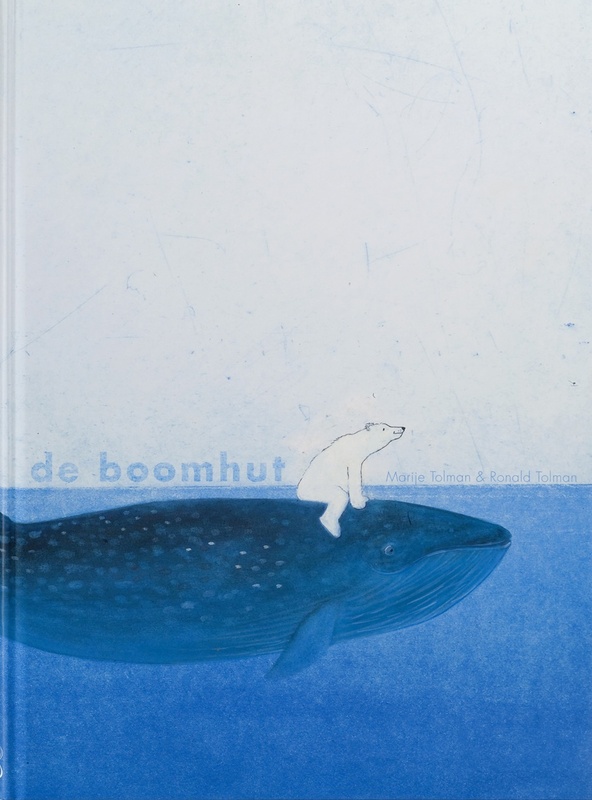 In the opening pages of this stunning (and wordless) picture book, a polar bear and a brown bear climb a treehouse in the middle of the ocean. After some exploration of their new abode, they do what any two bears would do in a treehouse: make toast and crack open some books. However, a tree house in the ocean is a tough thing to conceal, and soon the flamingos arrive, followed by a hippo, a couple of panda bears, owls, crows, and the ultimate party crasher, a rhino. Although welcoming, the two bears spend a lot of time looking off into the distance while the locals make merry in the branches of the treehouse. Yes, even introverts, introverted bears, have parties. As the guests disperse, the story ends. There is no follow-up page with warnings about pollution and the necessity of conservation, or the tragic plight of the polar bear. Sometimes a Tree House is just a treehouse? Surely not. I’ll go out on a limb (without a prehensile tail, I might add) and state, unequivocally, that Anthony Browne is the best monkey artist of all time. Perhaps if Van Gogh had painted a field of monkeys instead of a field of sunflowers, I would have reason to adjust my statement, but he didn’t, and so Browne is, and will always be, the King of Kongs. One of my earliest memories of working in the bookstore was a woman flapping a copy of Gorilla by Anthony Browne in my face and vehemently stating, ‘This book is about child abuse, and it should be removed immediately!” I had not read the book, but as I flipped through it with the woman hyperventilating beside me, I felt like thanking her. 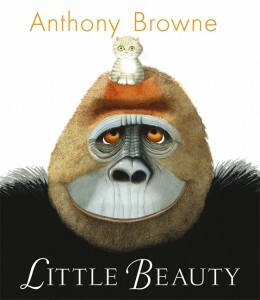 Of course it wasn’t about child abuse and I didn’t remove it, but from that point on I became a fan of Anthony Browne. Unease. Disquiet. Anxiety. Not the usual payoffs you find in children’s picture books, unless the author’s name is Grimm. Or Sendak. Outside Over There is the third of Maurice Sendak’s self-described trilogy, which includes Where the Wild Things Are and In the Night Kitchen. 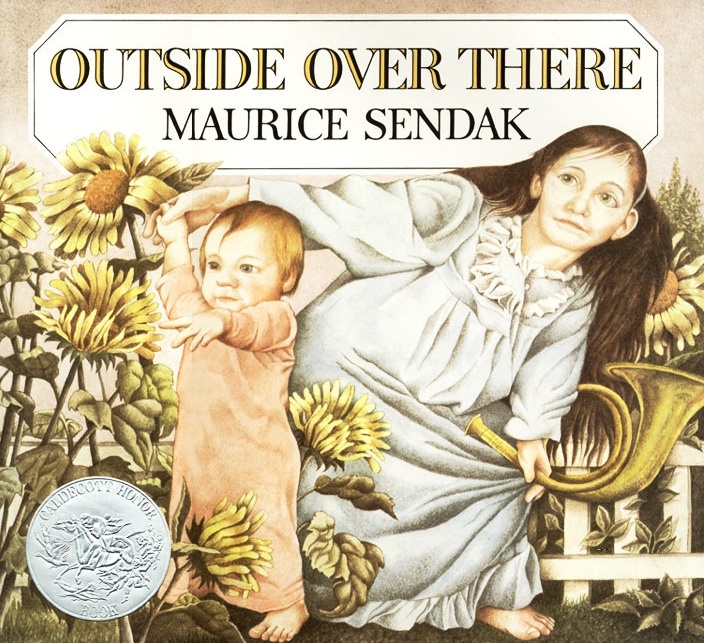 Stylistically, I see no similarity, but according to Sendak, “They are all variations on the same theme: how children master various feelings – danger, boredom, fear, frustration, jealousy – and manage to come to grips with the realities of their lives.” Uh oh. Are these things supposed to go away with the onset of adulthood? Some of us retain a level of unease with the world that is mirrored and acknowledged in books like Outside Over There. Is that bad? 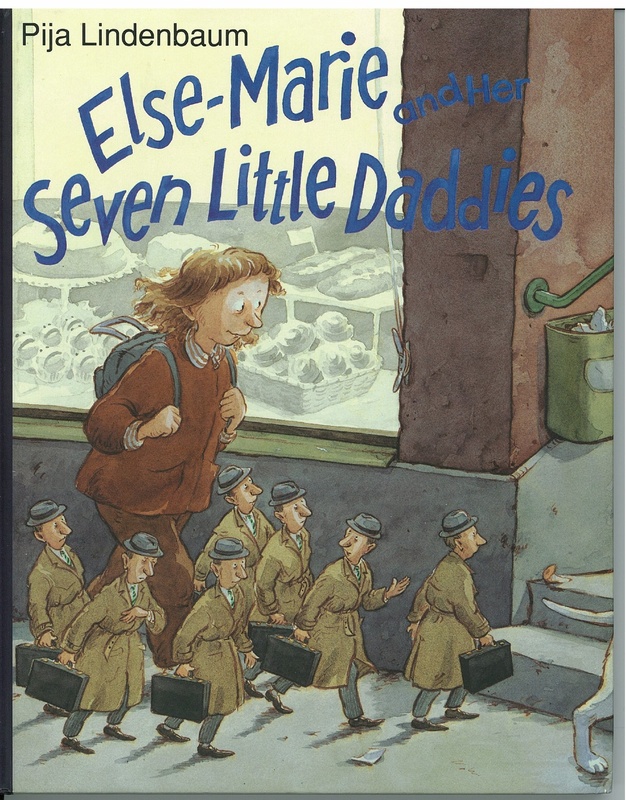 If you’ve ever suspected that Europeans are more uninhibited than North Americans, look no further than Else-Marie and Her Seven Little Daddies. The Swedish edition. 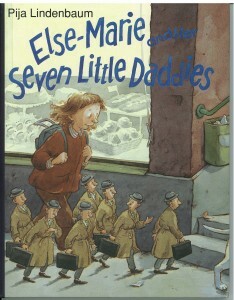 My friend and fellow bookseller, Loraine, brought back a copy of Else-Marie and Her Seven Little Daddies from Sweden in 1991. The deliciously whacked story of a kid with seven identical (and diminutive) daddies is a blast, especially as no explanation for the multiple fathers is provided. Steaming cups of coffee are visible in several scenes, therefore one can assume this is not a family of feminist polygamist Mormons. However, it is a story about difference, and childhood mortification. The conflict occurs when Else-Marie’s mother has to work overtime and can’t pick up her daughter from school, leaving the seven little daddies to step in and take her place. Else-Marie loves her daddies, and worries they will be teased for their size and quantity. Who hasn’t been embarrassed by their parents at one time or another? I still am. However, the daddies are an affable lot, and both Else-Marie and her daddies make it through unscathed. After a meal of fried fish and cream puffs, the family curls up on the couch together to watch an episode of the Ingmar Bergman Comedy Hour. Home Swedish home.